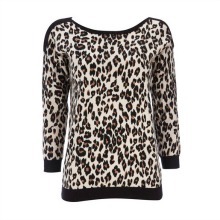 This gorgeous Leopard print sweater is a perfect way to channel the trend of animal print on into winter. A warm sweater with striking black trim detail, and delicate keyhole back opening with a pretty ribbon tie. Team this with your favourite denim and boots for a gorgeous winter look. 50% Cotton,20% Nylon,20% Viscose,10% Angora. Machine washable.